Many anglers never consider using dry flies when fishing high and off colour water, but you should not rule them out. While getting the fly down to the fish is definitely the most effective way to fish at these times, dry fly fishing can be a worthwhile diversion. The key to fishing dries under these conditions is to target the areas of “softer” water where you can get a slow drift. This will not only allow the trout to spot the fly but also give it time to come up and take it. Larger bushier flies that give a good silhouette against the lighter sky will often be more effective. A delicate presentation is not necessary and “slapping” the fly down with authority will often alert the fish that dinner is served. Skating or twitching the fly can also draw attention to drift that might have otherwise gone unnoticed. Remember in all fly fishing you are trying to imitate life, you want the the fish to believe that what it is about to eat is alive. 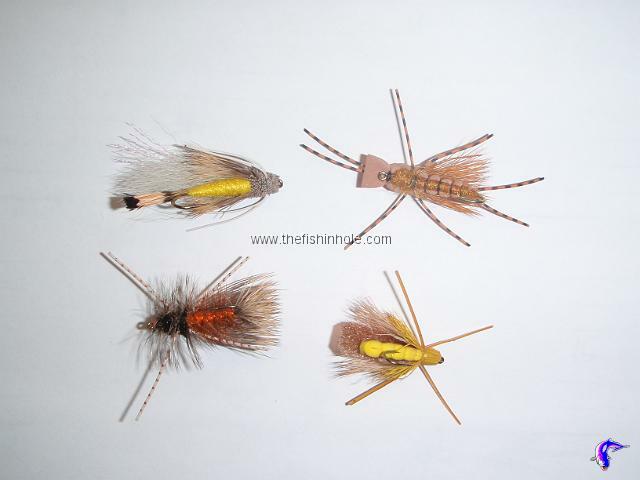 Materials that move such as rubber legs, or reflect light such as flashabou and tinsel, all help in making the fish believe that your fly is alive and not just another stick floating down the river. Remember you’re not matching the hatch at times like these but rather getting your fly into a likely looking area where you can get a prolonged drift. The next time you’re faced with off colour water and you’re tired of “chuck and duck” nymph and streamer fishing, give the dry fly a shot, you might be pleasantly surprised.